Our route home from Japan included a leg from Abu Dhabi to New York (JFK) on the Etihad A380 in the Apartments. The leg is the reason why we planned this trip to Japan in the first place, we managed to get a points ticket in order to enjoy a one-of-a-kind travel experience. The apartment is amazing, it is luxury and uber swanky. It consists of a bench seat that converts into a bed and an ultra wide seat. We planned it so our Apartments are next to each other which allowed us to retract the wall so we could communicate easy and half sleep side by side. The apartments give a pretty private space but unlike the Emirates First suite, the doors have a lattice design that allows the flight attendants and other passengers the ability to peak in while walking by. The amenities in the apartment are steller. Power plugs, 2 x USB, an HDMI port (which is an amazing feature), an oversize tray table for dining alone or together, and a door that shuts out everything else. The space is awesome and pretty cool considering we are in the air and downstairs in economy there are 8 people in the space one apartment takes. There are lots of little nooks and crannies where you can store your junk but the space for your carry on is actually pretty tight. It almost didn't close, and our carry-ons are definitely standard size. There is also a vanity that has an amenity kit and various mirrors and lighting. I guess when you want to freshen up your makeup after a long 14 hour flight. The airplane has reliable wifi which was great, the plane has it's own cellular network too if you want to use your international roaming. The service has been amazing. They have an on board chef, ours was James, that prepares food when you want it. The flight attendants are really friendly and nice and are at your service. 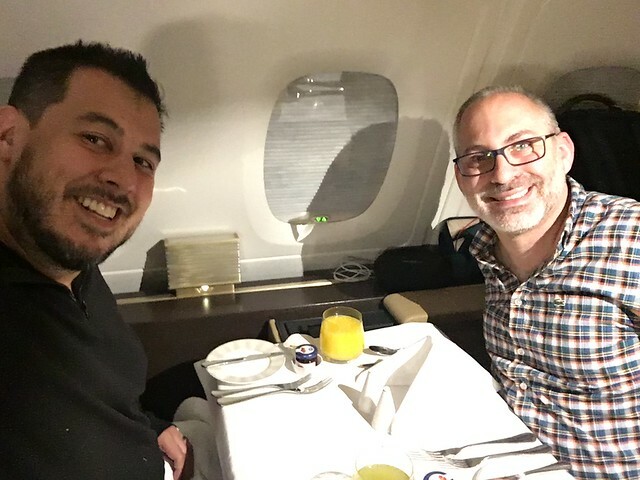 Of course we are always polite and friendly but some people can be simply assholes, especially in first class. The menu is extensive and has a tonne of variety. Of course I ate too much. But I tried to spread it out. Nothing wrong with snack, 3 course dinner, second dinner, dessert, and breakfast over a 14 hour time span is there? I didn't go too fancy like Brad who had foie gras, I stuck to some basics like Steak Sandwich, carrot cake and the sliders which were amazing. I'm not a fan of sliders but these were pulled beef. Of course we had to shower. We planned to shower at the end of the flight since we had cleaned up at the lounge before we got on the flight. You get 5 minutes of water which is more then enough I find, but of course I am a short haired male. The time allotted for your shower is 30 minutes and you are able to stop and go the shower to spread out that five minutes a little longer. The amenities provided aren't as luxurious as Emirates first, you get the basics and whatever amenities are included in your vanity: toothbrush, razor, etc. The entertainment system is awesome. The usual movies and TV but it has some awesome features. You can call another seat. You can message another seat. If you are watching something you can share it with another seat too. You can sync it so you are both watching the same media. Awesome. And being able to plug in your iDevice to the HDMI port was amazing and we definitely used it since we never travel without an HDMI connector and cable. Overall the flight was amazing. I wasn't a huge fan of the Abu Dhabi airport but I think they are building a new terminal, so twist my arm, I would definitely not say no to this flight again. Everything about the flight was awesome and definitely a memory for life.